… with 1 line of code! Yes that’s right, you can do it with 1 line, but lets make it 3 so it looks good. Open up your Chernarus mission .pbo which is in MPMissions folder on your server. Save, repack, restart… and enjoy your Chernarus roads junk free! 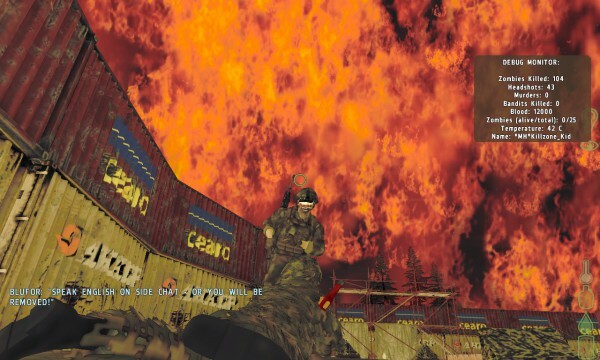 EDIT: After some testing it has been confirmed, everything extra Rocket put on Chernarus is removed including some of the camps he built like around Balota, etc. So potentially you are going to lose some loot spawn points, but on the bright side, you can now build your own camp sites using mission editor instead. My friend is making a tutorial on how to add custom bases and other stuff to the map via mission editing which still works with vanilla DayZ, I will post a link to it when ready. EDIT2: And here it is! Enjoy. Awesome job as usual man! Keep up the good work! Now if you could only figure out a way to overwrite the config.cpp file from the dayz_anim.pbo file in the mission file, you would be a GOD among men! I wish I could, been bending my head around it ever since. You can hack calls to config.cpp from scripts and substitute data though, but that’s about it. But if you want to overwrite classes you have to use another mod. BTW man, I use your KK tools daily! I can’t find a donate button on this site, what is your email address, cause I’d like to support the cause! Damn that was quick! I thought I was going CrayZ for real! Anyway, just donated! And btw, even if we don’t comment ALOT of people are following what you do! This is very cool i was wondering if you have stop doing these blogs ? But i would love to see some more of this, i was just wondering as the last one was a long time ago now thats all. But the toolz very cool and all this stuff help me learn and understand how to do stuff ? I don’t know how to save or repack? please help/ using pbo manager. Hi there, this worked perfectly, but after installing freds wardrobe and salvage parts, the roads are wrecked again, i checked the init, and the lines of code are still in the right place, but it wont remove the junk. Any ideas at all? Make sure you paste the code in init.sqf after all other modifications you’ve installed. I don’t think this works on 1.8.0.3. I’m hosting with hfbservers. My mission file is named “dayz_1.chernarus.pbo”. I unpack that and open the init.sqf it says at the bottom #include”zaddonsdayz_codesystemmissioninit.sqf I open dayz_code.pbo and insert the script in that init.sqf. I run the server and it didn’t work. Am I missing something? Paste the code after everything in init.sqf. If this doesn’t work then it doesn’t work. I havent touched dayz mod for a long time so have no idea what has been changed. Thanks for the quick reply. I don’t think it’s working. it is working. Our server is running this way since this post has been made.